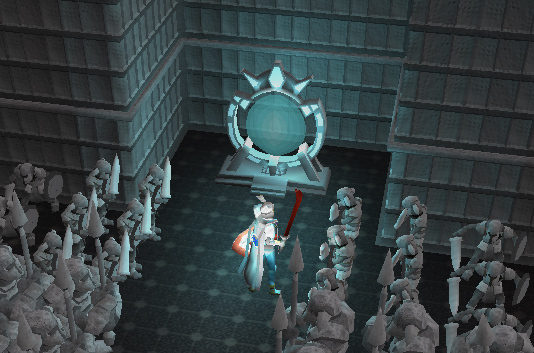 Among the rewards received at the completion of The Chosen Commander is the ability to return to Bandos's Throne Room, where you fought the Bandos Avatar. Why would you want to return? 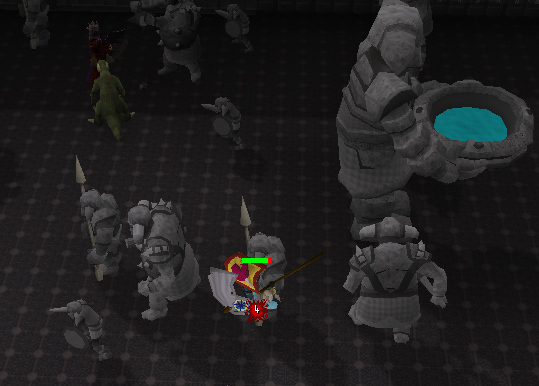 Well, the throne room is now both a multi-combat area in which you can train combat skills on some of the statues, and a course for training Agility. If you have the Magic level to use High Alchemy, it's highly recommended to bring along a stack of Nature runes and either a stack of Fire runes or a fire/lava staff. 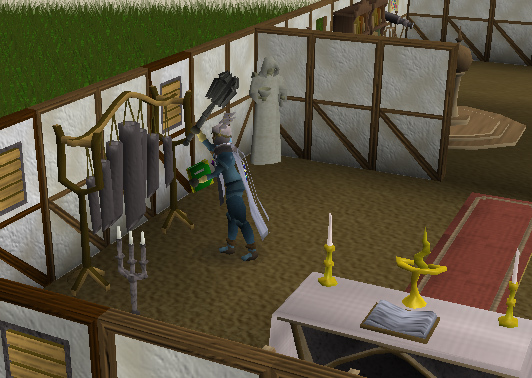 Use your magic to convert the higher-level maces and Earth staffs you don't want to keep into gold (Battlestaves and Mystic Staffs may be worth selling on the Grand Exchange, depending on current pricing). Along with the GP dropped by Ogres, it's possible to make 20-40k per trip by this method. With the same runes/staff, you can also Superheat the ores and coal dropped; whether it's worth doing is a matter of personal preference. It's also recommended to wear good armour (rune or higher for melee) and to bring 5-15 pieces of food (depending on your defence level) so you can maximize your time there. Optional inventory items: a teleport method if you don't want to walk to the Dorgesh-Kaan bank when you're done; stat-boosting potions to increase your effectiveness; a pouch for a Summoning familiar which fights or acts as a Beast of Burden. Prayer potions aren't usually necessary unless you want to go after the Ourg. Speak to Oldak about traveling-over-distance spheres, and you'll find throne room spheres added to the choices he offers. You'll need two law runes and one piece of molten glass for each sphere you want. Break the spheres as usual to be teleported to the throne room. If you've gotten far enough in the quest Fairy Tale Part 2: Cure a Queen to have access to the Fairy Ring network, you can use code BLQ to return to Yu'biusk. Once you are there, walk northwest to the Strange Box, right-click on it, and choose "open". After a few seconds, you'll be transported to the throne room. 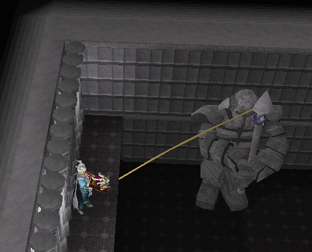 The agility course consists of the same line of statues by which you reached the throne during the quest. Just as you did in the quest, climb on the goblin at the head of the line, jump over to the ork on his right, then jump along the line until you can jump to the ledge. From there, grapple the Ourg's spear, and swing to the throne to complete the course. Each individual jump earns only 2 xp, but when you make the final swing across to the throne you receive 380xp (you'll still need to jump from the throne to the floor, which earns no xp). The catch is that you can now slip and fall from any statue along the line, and will lose up to 80 Life Points each time you do! Once you fall, you must go all the way back to the beginning and start from scratch. 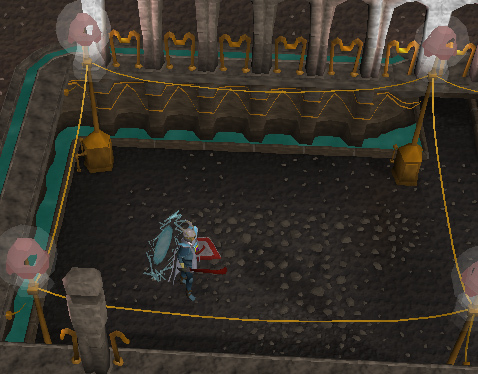 If planning to train Agility here, don't forget to equip a crossbow and a mithril grapple. 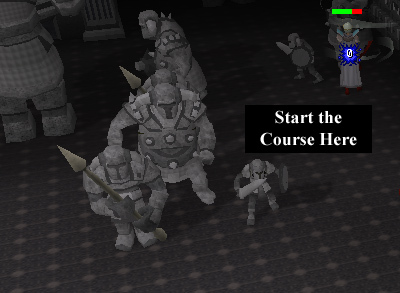 You may also want to bring some food, since this course can do a surprising amount of damage, and possibly a teleport method if you don't want to walk to the Dorgesh-Kaan bank when you're done. It's also wise not to equip any additional items except those that reduce weight, such as the Boots of Lightness. 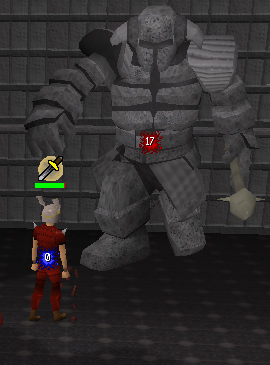 The non-agility statues are only aggressive to attackers, so you shouldn't need protection from them. Note: It is not recommended to do the course in full rune as pictured! 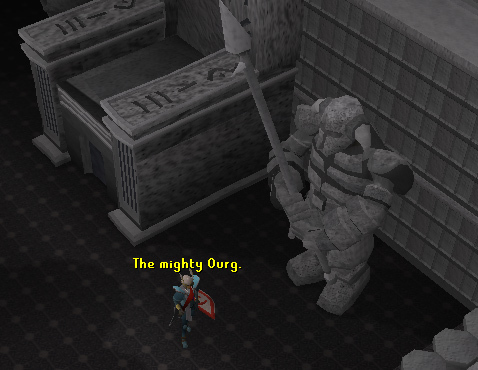 The ranks of identical Ogres at the far end of the room have returned to being nothing but statues - although they've helpfully stayed in position to give access to the exit portal - but the rest of the statues surrounding the agility course have kept some magic. If you left-click on one of these statues, or right-click and choose "climb on", with a swirl of magic it will come to life and attack you! Your potential opponents are a number of level-75 Ogres, level-63 Orks, and level-50 Goblins. The Orks, although they have spears, are apparently too stupid (or too stony-minded) to realize that spears are meant for sticking into opponents, and will instead bash you over the head with them. Once the statues have come to life, they're mobile, and will lumber after you if you move. Also, since the area is multi-combat, if you click on several statues in succession they will all attack - and of course other players may choose to attack the same statue you're fighting. Last but not least, the Ourg statue to the right of the throne can come to life as a level-200 opponent. The Ourg can hit high, so don't underestimate it! 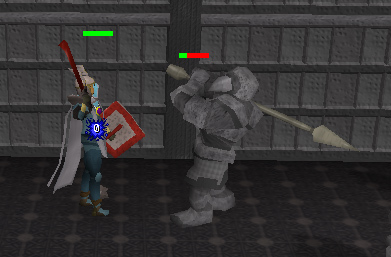 This player is wisely using Protect From Melee. 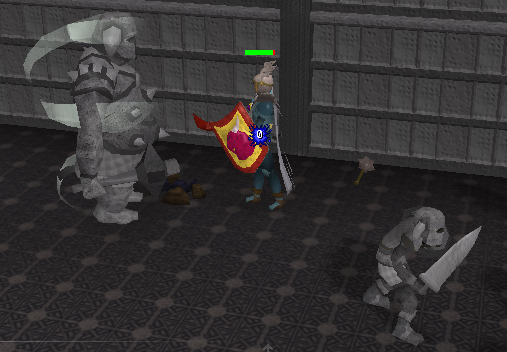 Rangers and mages can safe-spot the Ourg from the area between the agility course and the smaller attackable statues, along the right side of the room, or from the area in front of the throne. 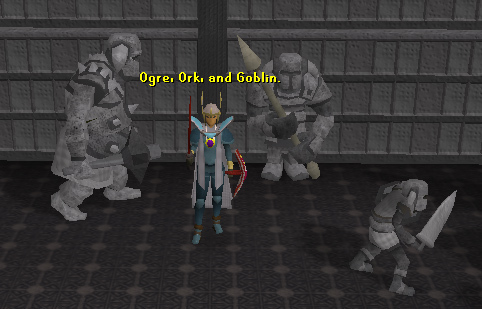 As far as is known, the Ourg's drops are identical to those of the Ogres, so the only advantage to fighting it is getting more xp. Maces from Iron through Adamantite. GP, which is worth mentioning because the Ogres and Ourg drop big stacks - 1,000 at a time! The gem drops are frequent, and very useful if you're training Crafting. Ore drops are also frequent, but many players leave all but the adamantite - the drops aren't noted, and can fill up the inventory too fast. 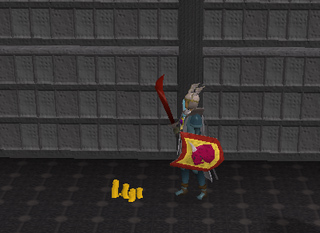 Most consider that this makes it a lesser weapon than the Granite Maul, which gives Crush +81, Strength +79. However, the Mace is somewhat faster and more versatile than the Maul. It also has the advantage of being a one-handed weapon, allowing you to use it in conjunction with a shield, holy book, or defender, and the slight prayer boost may be useful in some circumstances. 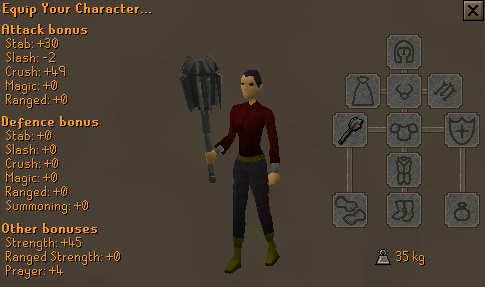 The Granite Mace is also handy for playing the chimes in your P.O.H. Chapel. 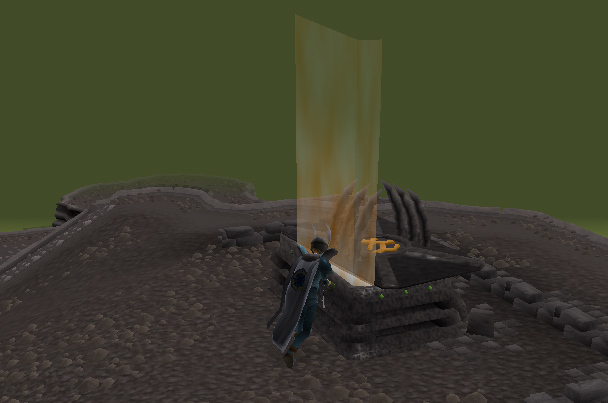 When you're done with the throne room, simply walk out the portal at the end. 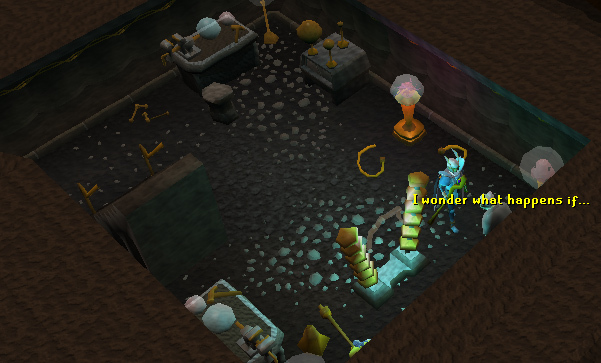 In a swirl of magic, you'll arrive at the south-eastern end of the Dorgesh-Kaan market, where Zanik first came out of the portal during the quest. Thus concludes our tour of Bandos's Throne Room.